Start Somewhere founder Leanne Pittsford dreamed of being able to network openly with other queer women in the tech industry. I had no idea what it was, but it sounded like my kind of party. Despite having put most of my conference plans on the back burner because of time and money limitations, it only took about 12 seconds for me to decide that I was going to get there, come hell or high water. So I did what all the cool kids are doing these days: I crowdfunded. Four hours after getting Leanne’s tweet, I posted my first Indiegogo fundraiser. As a full time freelancer, I no longer had access to a corporate sugar daddy to fund conference fees and travel expenses. But I have had time to build lots of great relationships. I turned to my community for help and they responded swiftly and enthusiastically. Four hours later, I was fully funded, with cash to spare, which I donated back to the summit scholarship fund. And so the theme for this entire experience emerged: Community. Growing up as a Black lesbian in Portland OR, the whitest major city in the U.S. (and getting whiter), didn’t leave me with an abundant feeling of belonging. I’ve joined plenty of groups, organizations, meetups, and sport teams, but never have I walked into a group and had the feeling that I had found my people. 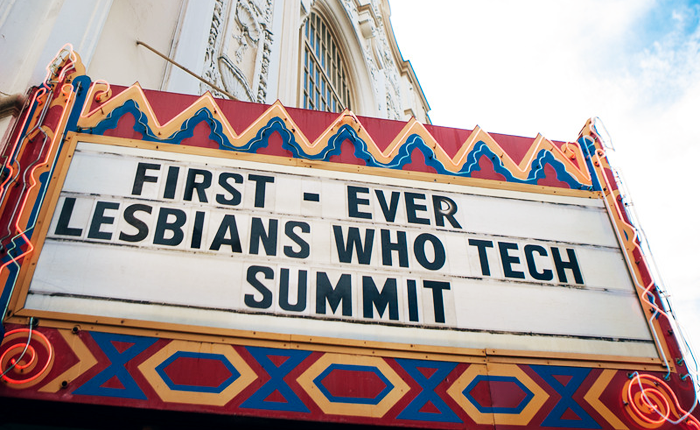 Lesbians Who Tech Summit seemed like a gathering that converged in the center of a venn diagram that was made for me: queer, nerdy, racially diverse women. The summit exceeded all of my expectations. The final registration tally was just shy of 800 people. We filled up the Castro theater in San Francisco. Photo by Nikki Ritcher Photography. The disaster that was the bathroom line was a small price to pay for the thrill of being at a tech conference, where not only was I NOT the only woman – I wasn’t even the only Black woman. Or the only lesbian. 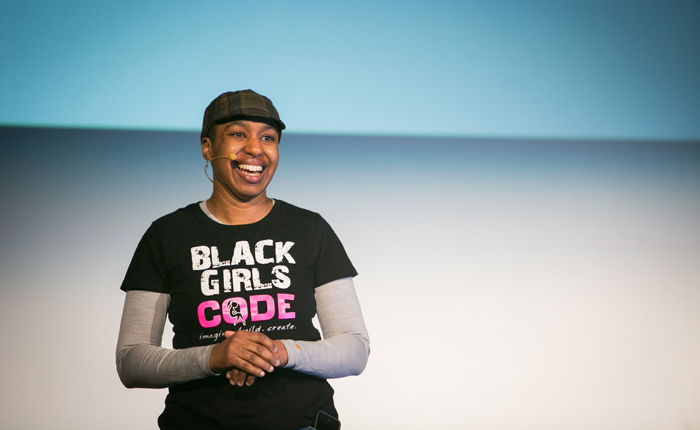 Or the only Black lesbian programmer with cats. To say the transition was overwhelming (in a great way) would be an understatement. I promised my introvert wife I would show her what it looks like to speak in front of a huge crowd. Photo by Nikki Ritcher Photography. 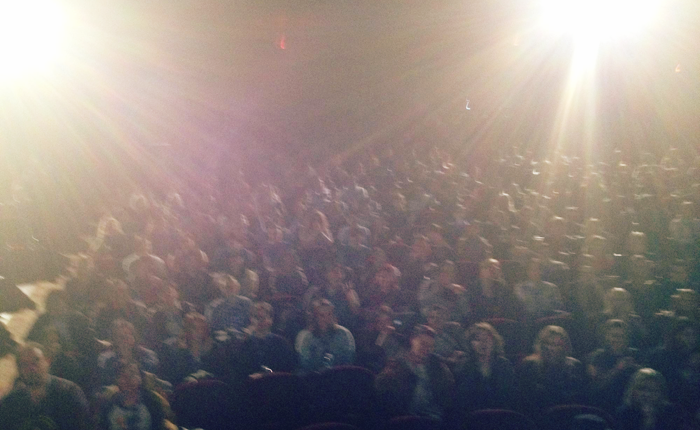 This is what it looks like to speak in front of 800 people. When I shared the results of my crowdfunding efforts with Pittsford, she was so excited that she immediately began shouting about it on every social media channel available. A few days later, she called me up and asked if I would like to speak in one of the 10 minute Ignite style slots at the summit. There were women in the program who were running startups, running organizations, women from well known companies like Twitter, Facebook and Pixar. I had agreed to share my story of switching tracks to become a developer in the middle of my career. It would have been perfectly reasonable to be intimidated by the company I was keeping, or the fact that I was presenting in front of the largest group I’ve ever been in front of, by several orders of magnitude. It would have been understandable to be nervous about not using slides when everyone else had visual media. I wasn’t concerned about any of those things. I wasn’t worried about people tweeting sexist jokes about me while I was on stage. I wasn’t worried about being judged. If ever I had been in a room full of strangers who were ‘my people,’ this was it. Everyone in the theater was rooting for everyone who went up on that stage. All I had to do was tell my story. I shared a snap shot of the long, unexpected journey that led to deciding to learn an entirely new skillset and change careers from project management to programming at age 34. I guess it also helps if you tell a few jokes in the process. Oh, and don’t forget to mention cats. 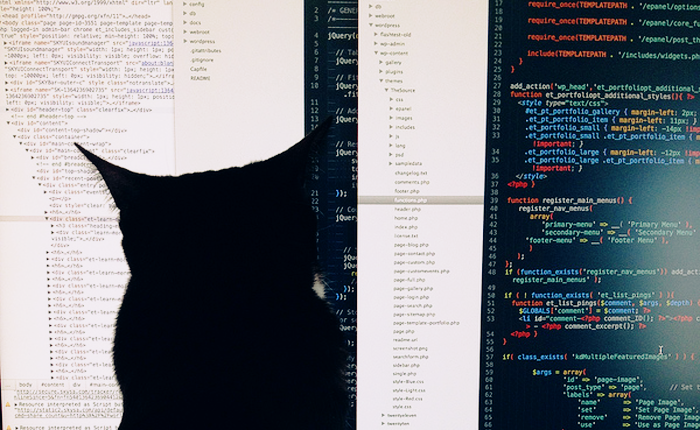 I said I practice purr programming, which is where you’re generally fighting a cat for control of the keyboard at any given moment. When I got back to my seat, my Twitter mentions were blowing up, with 90% of the tweets referencing my talk mentioning purr programming. In a room full of hundreds of lesbians, I guess I shouldn’t have been surprised. Many people came up to me for the rest of the weekend to thank me for sharing my story. There was one moment that highlighted better than any other the community-oriented and supportive nature of this summit that was so different from most tech conferences. The original plan was for the crowd to vote via Twitter hashtag for one of the organizations to receive a $5,000 donation. Executive Director Olga Talamante gives her pitch for Chicana Latina Foundation. Photo by Nikki Ritcher Photography. Someone in the audience objected, pointing out that all of the organizations were doing good work and they shouldn’t be in competition, but should split the donation equally. Cheers and shouts of agreement quickly followed. Moderator Courtney Cuff was a little taken aback by the sudden protest, but she rolled with it. Within minutes, summit emcee Taryn Miller-Stevens was on stage running an impromptu auction and before you could say ‘lesbians are awesome,’ at least $35,000 had been pledged from just a few audience members. Megan Smith, Vice President at Google, pledged $25,000 if everyone in the audience promised to give what they could. “And I trust you all to do it,” she added. Megan Smith pledges $25,000 to be shared between all the social justice organizations on stage. Photo by Nikki Ritcher Photography. 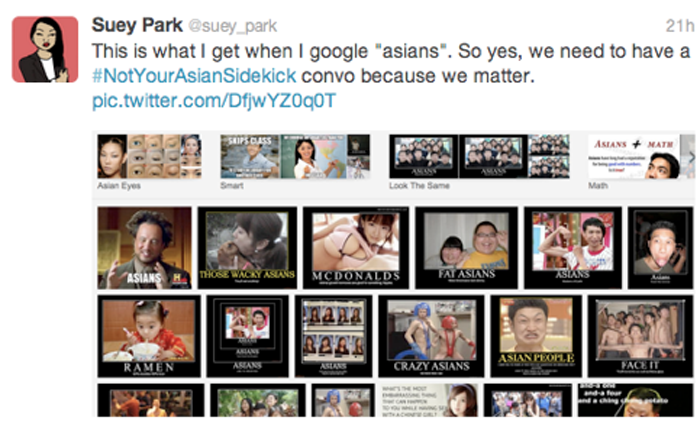 By the time we returned from lunch, an Indiegogo campaign had been launched. The campaign ended March 12th with a final total of $29,057. That is what happens when you have a supportive community that is focused on abundance over competition. The day was full of amazing speakers who talked about everything from the importance of being out in the workplace to using improv techniques to further your career. Although some of the talks were a little ‘Lean-in’ oriented there was value in every viewpoint. A policy at one of Levinson’s jobs prevented married couples from working in the same department. When her boss came to her to say she could not work in the same department as her partner, she pointed out that they weren’t married (it wasn’t legally possible at the time). “You understand the intent of the law,” said her boss. That conversation eventually resulted in Charles Schwab being one of the first large companies to offer domestic partner health benefits. In the afternoon, the focus switched from social good non-profits to up and coming startup ideas. Four judges came to the stage to hear ideas from four amazing lesbian entrepreneurs and pick a winner to receive a $2,500 prize. 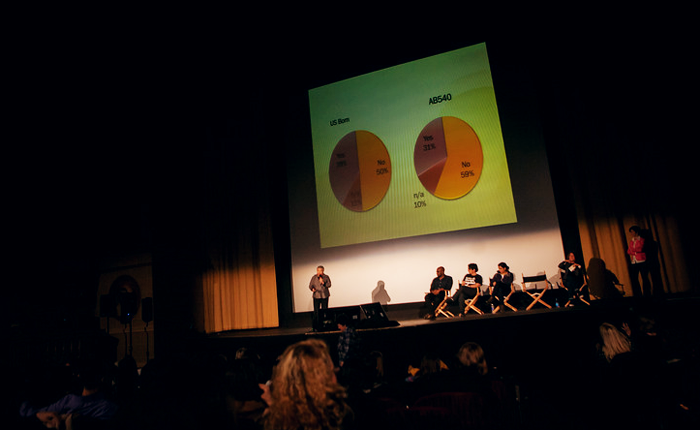 Ideas presented included ambitious, big budget pitches like Allie Esslinger’s Section II which seeks to bring more quality LGBTQ entertainment to the screen and more locally focused (for now) projects such as Krys Freeman’s HeLLa Rides app, which helps Bay Area commuters find each other and stop driving alone. Rachel Wolan pitched YadaZing, an app to help people learn everyday English from TV and movie videos. The unqualified hit of the summit was the presentation of Dattch, a new dating app specifically for lesbians and bisexual women. The app was presented by Founder Robyn Exton, who had a highly polished and thorough presentation that highlighted how Dattch caters specifically to the ways that women meet each other. Exton won over the judges, who awarded her the $2,500 prize for best pitch. Then she won over the audience by announcing the release of Dattch for the San Francisco area that very evening. I wouldn’t be surprised to learn that the app was an overnight success, if you know what I mean. In addition to the structured presentations on Friday, the summit also included events happening all weekend around the city. 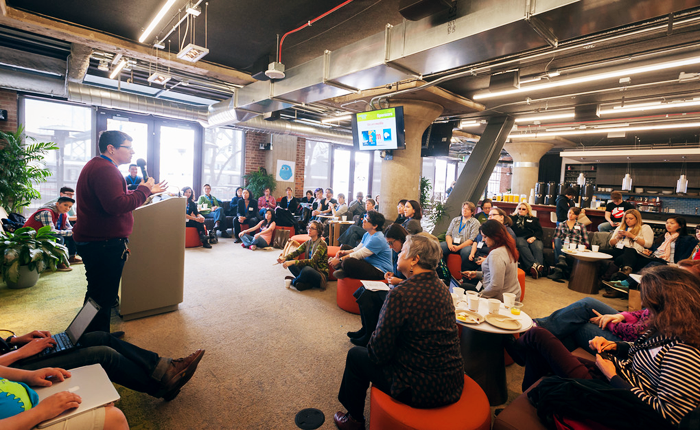 Lukas Blakk hosted a weekend long hackathon at the gorgeous San Francisco Mozilla office, which offered plenty of open space, break out rooms and was stocked with delicious food to fuel hackers all weekend. Photo by Nikki Ritcher Photography. 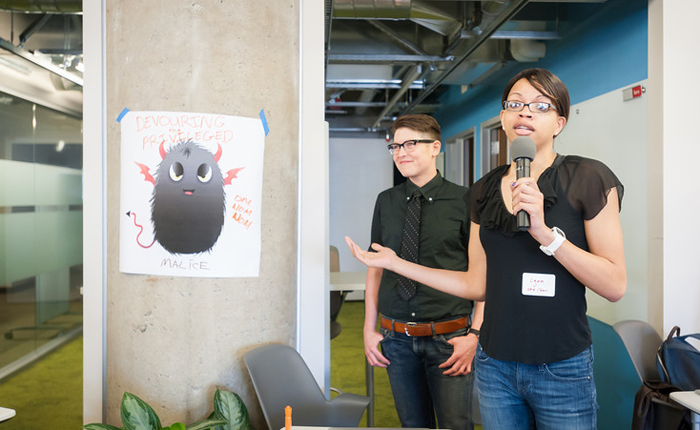 Social justice non-profits, including Astraea, Chicana Latina Foundation, AllOut, Maven, and Refuge Restrooms pitched their needs to the entire group at the beginning of the weekend. Requests ranged from a new mobile responsive website for AllOut to a new online-based scholarship application process for Chicana Latina foundation. Astrea needed a way to highlight the work they’ve done to the community in a beautiful way. Hackers hard at work. Photo by Nikki Ritcher Photography. Teams formed to work on the requests from each organization, with folks offering an array of skills: coding, design, project management, data entry and photography. Urvi Nagrani offered free headshots to all the participants. At the end of the weekend, the teams presented their solutions to the organizations and the larger group. 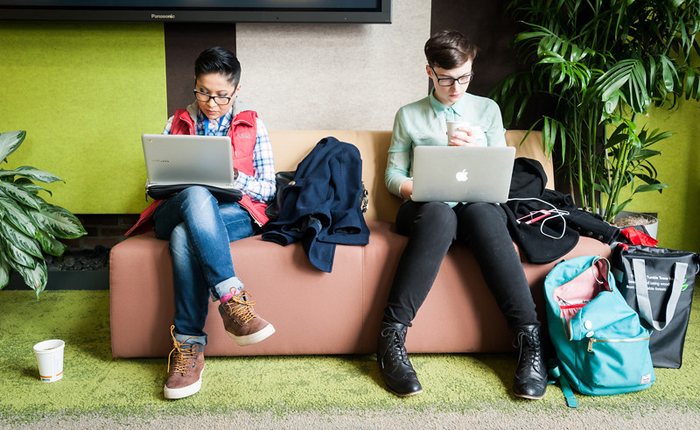 Lesbians Who Tech has a detailed recap of the hackathon. The teams accomplished an impressive amount of work in just two days. Hackathon participants presenting their solutions. Photo by Nikki Ritcher Photography. 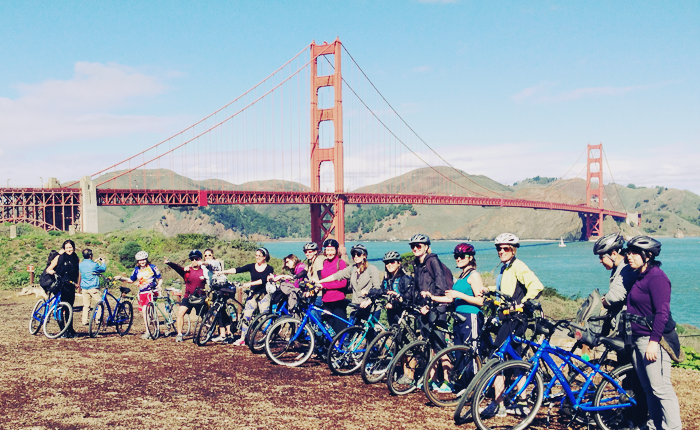 Those who pre-registered, showed up at the Sports Basement Saturday morning to rent bicycles and ride over the Golden Gate Bridge and into the little town of Sausalito. The ride was expertly and graciously led by Megan Andrews. A ride angel turned up in the form of a woman named Bing, who showed up and drove to the stopping points to take group photos and also brought us lunch from her Korean BBQ restaurant. The weather even held out and we enjoyed sunshine and gorgeous views for most of the ride. Various parties, gatherings and dinners continued spontaneously throughout the weekend, organized via Twitter hashtag, the Lesbians Who Tech Summit app and good old fashioned texting and phoning. It all culminated on Sunday with the final closing brunch, held at Asiento restaurant in the Mission District. The first ever Lesbians Who Tech Summit left me exhausted, inspired and hopeful for the industry. I will definitely be adding it to my permanent list of don’t-miss conferences. Frankly, I’m not sure if I want to go back to the standard bro-filled tech meetups and conference I’ve suffered through in the past. Now that I’ve seen how good it can be, there’s no going back.